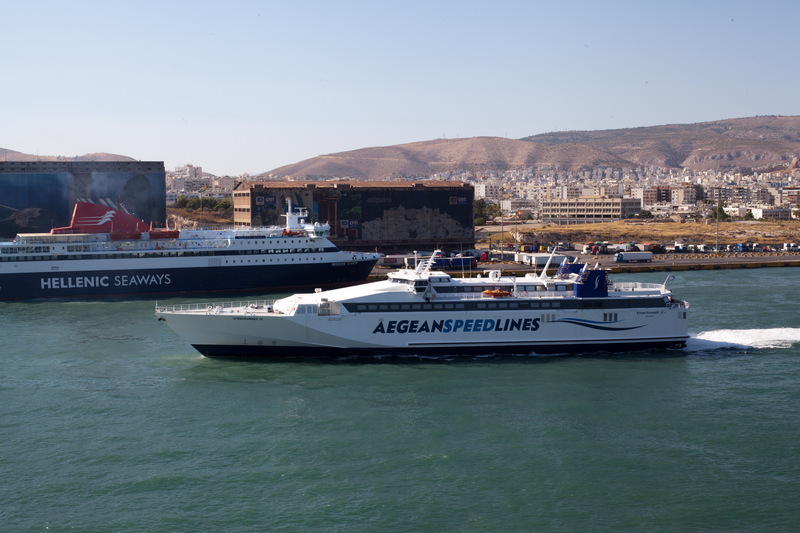 HSC Speedrunner IV is a fast ferry owned and operated by Aegean Speed Lines. She is used on a service between Pireaus, Serifos, Sifnos and Milos. She was built in 1999 at Fincantieri, Riva Trigoso, Italy, for Sea Containers Ltd, but entered service only in 2000 for Sea Container's subsidiary Silja Line. In 2006 she was transferred to another Sea Containers subsidiary, SuperSeaCat. In 2009 she began service with her current owners. SuperSeaCat Four was the fourth and last mono-hulled fast ferry to be built for Sea Containers. Originally it was planned that she would be set in traffic between Brindisi, Italy and Çeşme, Turkey. The plan was abandoned however, and after delivery in May 1999 SuperSeaCat Four was laid up in La Spezia, Italy. In 1999 Sea Containers acquired the majority of shares in classic Finnish shipping company Silja Line. Silja were at the time operating traditional ferries on the highly lucrative route between Helsinki and Tallinn, the capitals of Finland and Estonia respectively, but had no fast ferries operating on the route. Sea Containers decided to set their extra SuperSeaCat on that route, and from 17 April 2000 onwards SuperSeaCat Four sailed on the route under Silja Line SuperSeaCat brand. Due to the Baltic Sea freezing during winter, the service could not be operated between January and April each year. The ship spent those months laid up. In 2003 Sea Containers added a second SuperSeaCat to the route, HSC SuperSeaCat Three. For the summer season of 2005 a third ship, HSC SuperSeaCat One was added to the service. In late 2005 Sea Containers decided to sell all of their ferry operations, including the profitable Silja Line. Silja Line was sold to the Estonian ferry operator Tallink, who already operated several fast and conventional ferries between Helsinki and Tallinn. Taking over the SuperSeaCats would have given them a dominant market position on the route. Because of this the SuperSeaCats were branched off from Silja to form a separate company, SuperSeaCat.